Artist Benjamin Todd Wills with his 'Airplanes' display. "I thought it was such a nice object stand-in for that person, that I started asking at the end of my letters to everyone, ‘If you have a moment, I would love to receive an airplane from you,'" Wills told Central Standard host Gina Kaufmann. If you tell two people to make a paper airplane, the results will be pretty different. So different, Wills says, that planes can be stand-ins for individuals. And as a symbol of freedom, the airplane is an especially poignant representation of a person if that person is a prisoner. 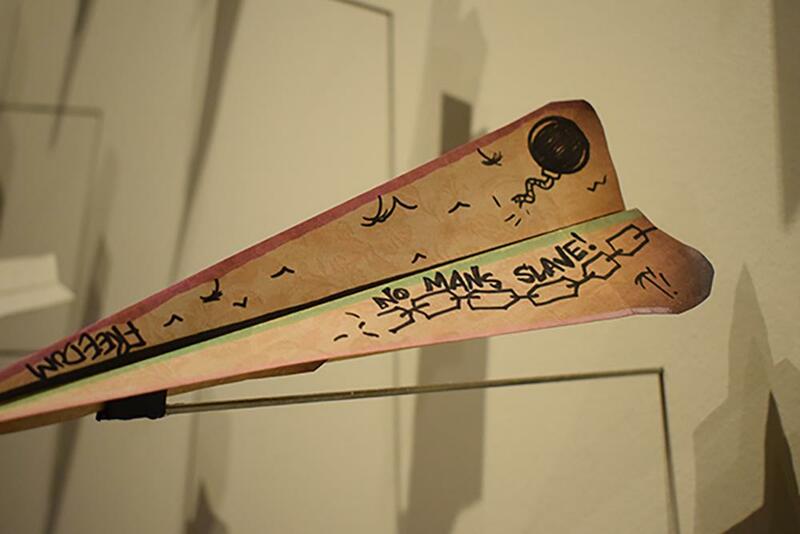 One of the prisoner-made airplanes in Benjamin Todd Wills' exhibition. To date, he's received around 500 planes, each as different as its creator. "Sometimes it's very apparent that an inmate has come up with some creative way to get paper or to add color to them," he said. "Some of them have homemade ketchup-turns-into red-kind-of paint on them." Wills began what is now a letter-writing campaign about five years ago. He had two friends in prison. They eventually asked Wills if he'd be willing to write to others who never receive mail. He said it quickly became apparent that incarcerated people need some sort of connection to the outside world. "There's a lot of repeated phrases, like ‘This is the first time somebody has written to me since the beginning of my incarceration.' Or: 'This is the first time my name was called during mail call.' Somebody wrote this week that it was the first letter they received in 11 and a half years," Wills told Kaufmann. A paper airplane mailed to Benjamin Todd Wills by an inmate he corresponds with. According to the Prison Policy Initiative, the United States locks up more people than any other nation. As of 2018, there were 2.3 million people confined in local, state, federal or juvenile facilities. With 693 people locked up for every 100,000 residents, that's a higher rate than any other country. Wills said he feels a social responsibility to try to help his community. He thinks reaching out to incarcerated people isn't happening enough in the United States. "We have a focus on punishment instead of rehabilitation. We have for-profit prisons, we have companies that make a lot of money with incarcerated people. If you look at a program like ours, as opposed to something like a program in Norway, we have a recidivism rate of about 76 percent, where they have a recidivism rate of about 20 percent," Wills said. He said he has read that in other countries, correctional systems allow inmates to hang onto their personal identities more than in the United States. Also unlike in the United States, corrections in some other nations includes elements of community outreach, medical intervention and education. 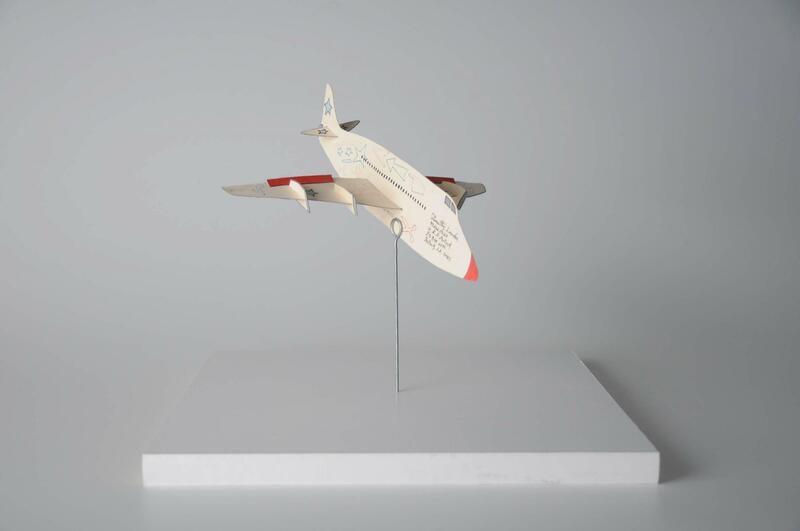 Each plane is significant as a stand-alone object, Wills said, but their message is stronger when they're viewed as a collection as they are now at the Kansas City Public Library. "I really have started talking about the project more like a choir," Wills said. "Each one of them is sort of a soloist at one time, but if you step back, the message that they send together is very overwhelming and a really beautiful kind of mix of shapes and colors and shadows." The 'Airplane' exhibition at the Kansas City Public Library. He wants the prisoners to know that their planes are seen on the outside. Each time Wills displays the planes, he creates a postcard image to send to the prisoners. "Not only do they send their airplane to me, but they get proof of it being in Atlanta or being in Philadelphia or being in Kansas City. There’s something that they made that gets to contribute to a larger project that’s moving all over the country constantly," Wills said. 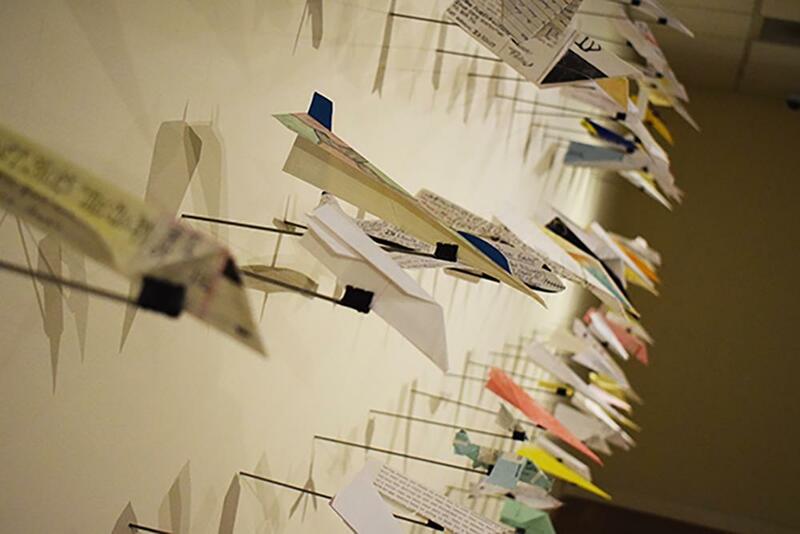 "Airplanes," through March 31 in the Guldner Gallery at the Kansas City Public Library, 14 West 10th Street, Kansas City, Missouri, 64105. Listen to Gina Kaufmann's full conversation with Benjamin Todd Wills here. When two trained and industrious young artists, each exhibiting a set of arresting photos, understand themselves less as notable new photographers than as people with serious questions who happen to have cameras – just like everyone else with an iPhone and an Instagram – the message is a striking indication of where the form is headed now. A man concealed by a protective suit carries a white body bag — a child victim of Ebola — while bystanders look on. A boy is passed to shore as a boat crammed with refugees attempts to dock on a rocky coastline. A young girl wearing a tiara and holding an award smiles confidently, while her companion looks upset and uncomfortable in her sash and bow-tie. A man, possibly their father or coach, poses victoriously for beauty pageant cameras. With the instant and reliable nature of cell-phone photography, most people have little need for disposable cameras. The old-school tools proved perfect, however, for a group of refugees documenting their new lives in Kansas City. A show of their photography opens Friday at the Kansas City Public Library, in an exhibition called "Indisposable: KC Cultures." The photographers originally came from countries including the Democratic Republic of Congo, Ethiopia, and Syria. Many of them settled in Kansas City less than a year ago.